Zach Peacock has the newest Low Card Ad for April 2009. 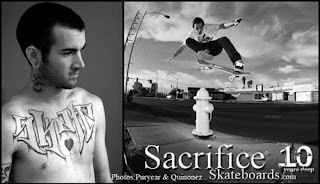 Alot can be said about Richard: artist, skater, father, husband, man of God, and my brother. I met Richard in early 2001 just after the collapse of Raven Skateboards and it was a dark time for me. I was bummed out on how cruel the skate industry really was. I ended up at the Northridge park with Jeff Greenwod and Mike McKinnis for a "cheer up session". They introduced to Richard and we just hit it off. A few weeks later Richard and I are eating burritos at my pad trying to think up a new name for the company. I tell him I never realized how much sacrifice was involved in trying to keep your own thing going. He looked at me and said, "Sacrifice, that's it!". 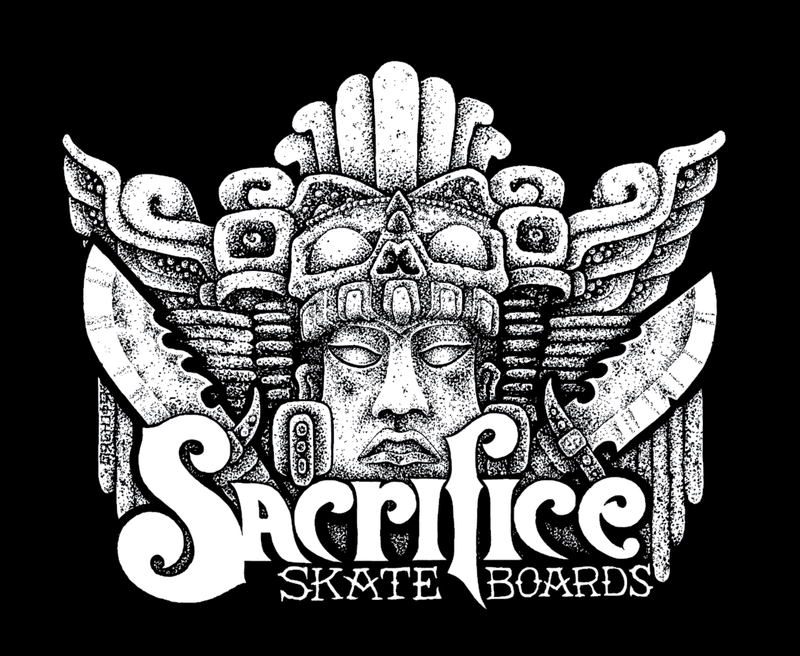 He drew the first art work for Sacrifice right there on my kitchen table, burrito juice and all. I owe this man everything and that's why I call him my brother, "mi hermano". Klein and Brooks save the day? Hope this is really true! Hey there - not to be all wishy washy about this but it looks like Concussion might not be a bag after all. Our esteemed colleagues Brendan Klein and Brooks Fritz have manned up and want to take over the mag from the two aging, bitter retards and make it more radical and shoot for a younger, hipper demographic. Just kidding about the demographic part, not so much about the aging bitter retards part ;) Anyway we're getting started on the next issue right now so if you have any budget left for this year and you'd still like to advertise with us, we'd love your support. I know that some of you transferred money around or cut your budget when we said we were going to stop publishing, so if that is the case then so be it. We'll do our best to beg and plead if we can, so please please get in touch with me and let me know if you would like to make it into #41 or if you can't do it due to budget concerns, etc. We'll do our best to make it happen. The drop dead ad deadline is Friday April 3, which is about 3 1/2 weeks from now. We are still working out the details and at the very least I'll be managing the production of this issue, but Brendan and Brooks will get brendan@concussion.org and brooks@concussion.org email addresses this week so you can start speaking with them about any future projects. More as it unfolds but that's today's news. Oh, and Happy St. Paddys Day, remember it's days like today where you should not drink and drive! Sacrifice pro Dave Nelson boxes in with a grinder. Photo: Jeff Garcia pole jams where few strippers would dare. I went to visit my good friend and team rider Ben Butler this past Sunday. As luck would have it, Jeff Greenwood, Aaron, Mike and Bart Saric showed up along with The Drain Crusher and a killer session ensued. A "TnT" later (courtesy of the Drain Crusher) and off we were to a killer permission Pork Chop with Mr. MRZ himself. Ben turned it on and shut it down. Photo: Butler crails in the sweet side pocket of the pork chop. Photo courtesy of MRZ and Concrete Disciples.